US 500: Retail trader data shows 25.7% of traders are net-long with the ratio of traders short to long at 2.89 to 1. In fact, traders have remained net-short since Jan 07 when US 500 traded near 2482.37; price has moved 13.4% higher since then. 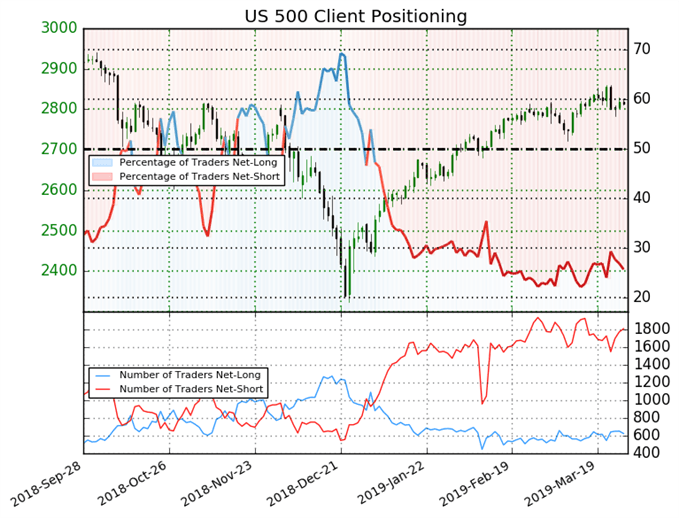 The number of traders net-long is 5.6% lower than yesterday and 3.1% lower from last week, while the number of traders net-short is 5.7% higher than yesterday and 7.7% higher from last week. We typically take a contrarian view to crowd sentiment, and the fact traders are net-short suggests US 500 prices may continue to rise. Traders are further net-short than yesterday and last week, and the combination of current sentiment and recent changes gives us a stronger US 500-bullish contrarian trading bias.